Your pool is the centerpiece of your backyard, and selecting a liner to stand out is important. Appearance and quality of construction are equally important. Century Pools pool liners are computer designed and cut for a perfect fit each and every time. Our liners are available in 28, 27 and 20 mil thicknesses of 100% virgin vinyl – All of our USA-made vinyl provide extra U.V. and antibacterial protection to look better, longer. See your Century Pool Pool Designer for details and more information about the best pool liners we have to offer. Look for NEW patterns this year coming soon and already available in store! For more information on the patterns and color of the pool liners available to you, feel free visit our liner manufacturers’ website: Pacific Pools and GLI Pool Products. 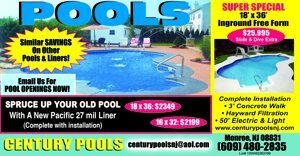 For questions about our selection of Pool Liners, please contact Century Pools at 609.480.2835 or fill out our Contact Form on the left side of the page. Look out for future announcements for our upcoming mobile showroom!